This past Sunday was my first trek on my summer of religious understanding. I am starting slowly, just going to a few places that are very different than my own but undeniably Christian. 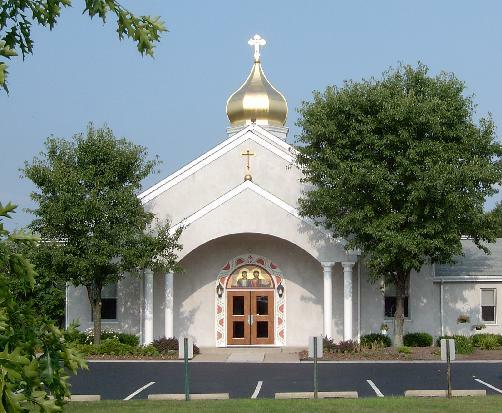 This week I went to St. Philips Antiochian Orthodox Church (pictured left). It was a great experience. First, the artwork was incredible. There was artwork on every square inch of the sanctuary, in typical ancient Eastern Christian style. Deep blues, reds, and lots of gold. The pictures told so many stories, I felt like I was a part of the stories themselves, surrounded. Right in front of me was a giant representation of Jonah being swallowed by the fish. I could’ve stared at it for a long time. Orthodox Christians allow icons and other pictures in their worship so this wasn’t surprising to me. When you first walk in you are greeted by a small painting of St. Philip (the patron saint of this parish) on a podium. Everyone kissed it and crossed themselves as they walked in. If a couple had a child, they picked up the kid so that s/he could also kiss it. Interesting. Second, the sounds. They chant everything in a sort of antiphonal sing-song. It was hard to tell the difference between a hymn, prayer, and Scripture reading, they all sounded similar. But I absolutely loved the ancient melodies and harmonies. I have to admit though, they got a bit tedious after an hour or so. It wasn’t all that surprising that no one brought a Bible with them to this church. But instead of being critical (which is my typical response to everything) I realized that they had the Bible all around them in pictures, in song, in chant, and in several Scripture ‘readings.’ Who am I to judge which medium is ‘best’ for church? Do we have to have a preacher preach every Sunday? They didn’t seem to think so and I don’t at all doubt their authenticity and devotion. We have such an Enlightenment focus on knowledge and ‘the text’ in so many churches, this was actually quite refreshing. My final surprise came when I was studying about their beliefs and happened upon their website. One of the “What we believe” sections talked about why they pray to saints, something Protestants are notoriously critical of. But the explanation was quite good I thought. Basically the argument is this: We believe that Christians have eternal life. That is, they remain alive even after phyiscal death. We often ask our friends to pray for us, why not ask our friends who are physically dead but still very much alive? Anyway, I won’t be praying to any saints any time soon, but that truly did change my perspective. Overall, I loved the experience. I will probably go back sometime soon.